Improving your parking lot is easier than you think with a little bit of elbow grease and a little bit of help from our team! Your parking lot is a big responsibility, and it can be difficult to maintain if you don’t have a trusted partner like Atlantic Maintenance Group on your side. Improving your parking lot is easier than you think with a little bit of elbow grease and a little bit of help from our team! 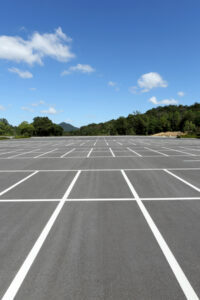 Here are five easy ways to make your parking lot better this year. It is a truth universally acknowledged that minor cracks eventually turn into major cracks in your parking lot. If you find small cracks, you should always monitor them to see if they get any bigger. This is especially important during the winter months, when vehicle traffic and bad weather will make them worse. Cracks should be filled as quickly as possible, or you could damage the cars going in and out of your parking lot. Do you have a parking lot-wide lighting system in place? If not, now is the time to invest! Parking lot lights help visitors to your property feel safer parking their cars. This is especially important if you have a parking lot on your property where cars stay overnight or late into the night. If you have the funds, consider also adding a security camera system to monitor the lot 24/7. When was the last time that you swept your parking lot? This regular maintenance task is essential for keeping your parking lot clean and tidy. A dirty parking lot can be hiding a great deal of cracking and damage that will get worse over time. Dirt and leaves, especially in the fall, can also block curbs and drainage and lead to flooding and standing water on your parking lot surface. Oil stains are unsightly and cause parking lot damage over time. If you find any oil stains on the surface of your parking lot, you should get rid of them as soon as you can. The longer that they are allowed to sit, the more damage that your parking lot could experience. Sealcoating is the best way to prevent water damage and oil damage on your parking lot. You should plan on having your parking lot sealcoated by a professional every 2-3 years, or more often if it has heavy traffic throughout the year. This entry was posted on Friday, November 3rd, 2017	at 9:18 pm	and is filed under Asphalt	. You can follow any responses to this entry through the RSS 2.0	feed. Both comments and pings are currently closed.